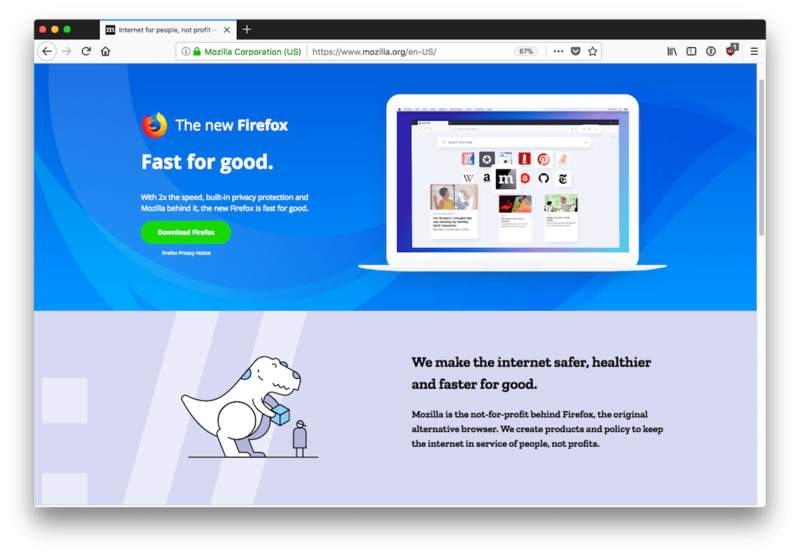 Firefox Quantum has just been released. I was once an avid Firefox user. Unfortunately, as the web engine in the previous version aged, it became slow and tired. So this is great news, especially for privacy focused users. In my casual, unscientific testing so far, the claims might not be too far from reality. It does appear to be fast. I'm not sure I care for the new look, but that has never been a problem with the ability to customise Firefox. I posted recently about the improvements to Safari. The control I gain from WebKit blockers. Along with continuity features, that would make it difficult to switch properly, even if I wanted to. 1 But as I learn more about web development, I can see myself turning more to the Mozilla offering. If you remember the bad old days, browsers haven’t always covered themselves in glory. Thankfully for users, we now have serious options. When you load it for the first time, you’ll notice that it looks different. Some highlights include a unified search bar that helps you get to what you’re looking for lickity-split, navigation icons are organized on the left and the far right side is where you can find all your personal items like downloads, history, screenshots). Even better, this bold new design and intelligent menus are easy to use and look amazing on PC, Macs, phones or tablets. I recently had my iPhone sent in for a warranty service. While it was there, the carrier gave me an Android to carry around 2. On thing I took out of it was, running an Android phone next to an iPad is not the insurmountable nuisance a lot of people think it is. I prefer not to do it, but not everybody has that choice. If you are mixing and matching, there are plenty of solutions for syncing all kinds of data. Firefox is one of those options. And, given the hodge lodge way that Android OEMs ship the OS, Google Chrome is not the same kind of native experience you get with Safari. That kind of choice is meant to be the part of the attraction. If you happen to be using an Android, and an iPad, I would consider giving Firefox another look. If your concerns lay with privacy, the performance improvements will be welcome indeed.